Last week I showed you some new fabrics and told you I was working on some new pillows. 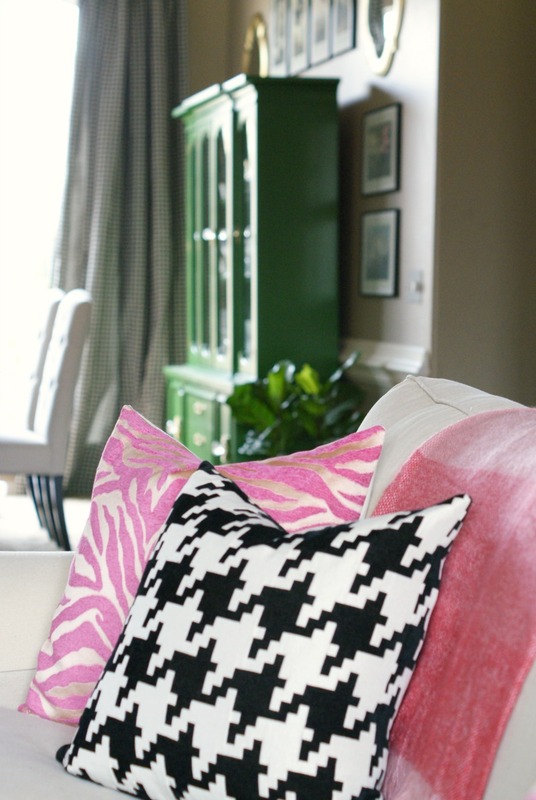 Pillows are one of the fastest pick-me-ups when you're feeling the need for a change. I've wanted to try adding in another color to my color scheme (whatever that may be)...PINK! When I chose the Waverly fabric for the dining room chairs, I was glad that there was such a variety of colors, including pink and red. I feel like I can switch back and forth with accent colors whenever the inspiration hits. I have a pink striped throw that I picked up for 70% off at Target last Fall, and I've been waiting for Spring to pull it out. The black and white stripe is Premier Prints. The Waverly bright floral is left over from the dining room chairs, and I probably made a big design mistake by repeating it in the living room. Hopefully it's not too matchy-matchy, but I like it and wanted some bright color on a pillow that wouldn't clash with the chairs across the room, so, I used what I had. 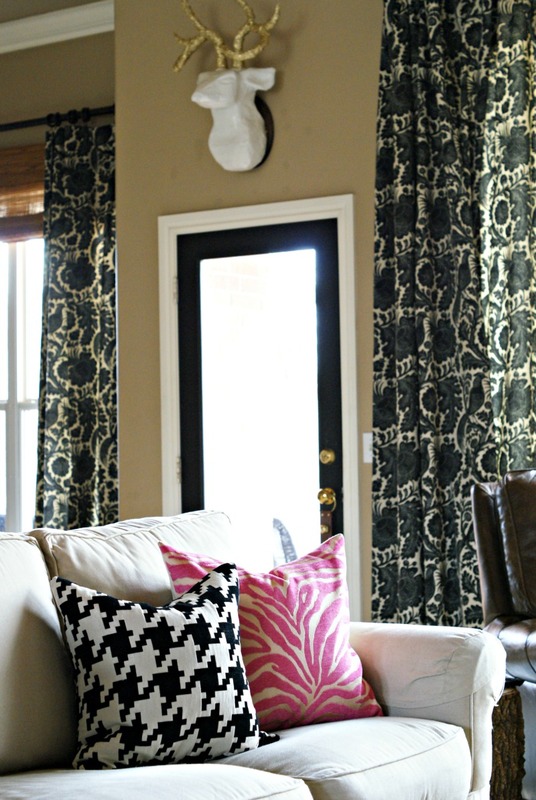 I also probably did a decorating no-no by using more than one animal print in a room...you're going to kick me off of your blog list! But does it really count since one is pink? I don't think so. The leopard and pink zebra are both from Hobby Lobby. The leopard comes in a really pretty blue colorway too if that's more your thing. add a little surprise with the zipper color! Really no one would know it's there, but I do. I confess, I didn't plan contrasting colored zippers on purpose. Last year our JoAnn fabric store was moving locations, and had a huge sale at the old store. I bought almost every invisible zipper they had left...for 75% off. I think I ended up with over 20. Zippers are expensive, so I stocked up! So, now if I don't have a color that would match the pillow and disappear, I pick a fun color that complements it. By the way, I use feather inserts in all of my throw pillows. We don't have allergy issues, and nothing compares to the fluffiness you get from a feather pillow. 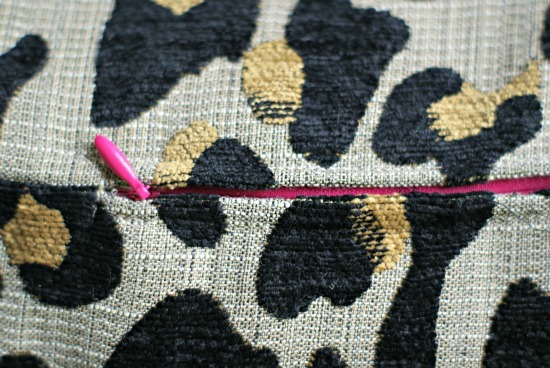 I also make all of my pillows with an envelope back or a hidden zipper so they are easy to switch out. 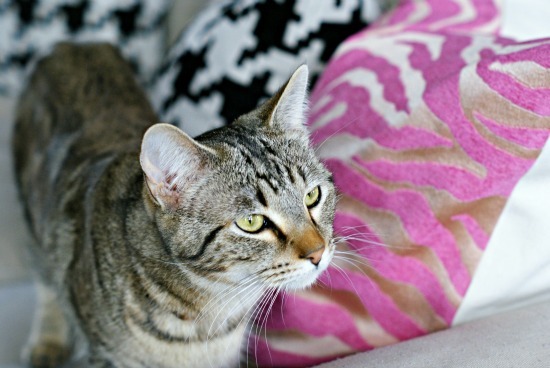 The Nester wrote a post with a great discussion in the comments about feather pillows here. Now, on to my favorite new pillow of the bunch. If you follow me on Instagram you got a sneak peek a few days ago. I love this pattern of ribbon trim, so I decided to try it out. 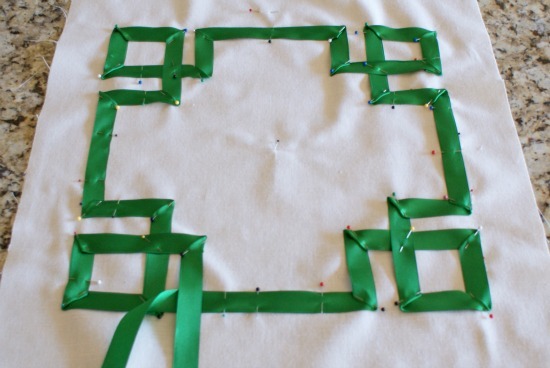 It wasn't hard, just time consuming and it took lots of pinning and measuring to get the pattern in place. I basically marked the border where I wanted it and starting pinning the ribbon down as I went. Then, I sewed it down on both edges, but you could easily use fabric glue also. Ever since reading about freezer paper a few years ago from Julie, who is the queen of freezer paper stencils I think, I've wanted to try it. I bought a roll ages ago and finally got around to using it. 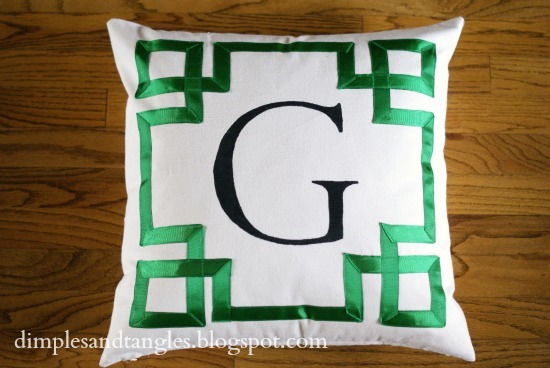 I considered making a new pillow with a large monogrammed "G", but didn't have the patience to wait for it to be made. So, when I remembered the freezer paper trick I decided to give it a try. 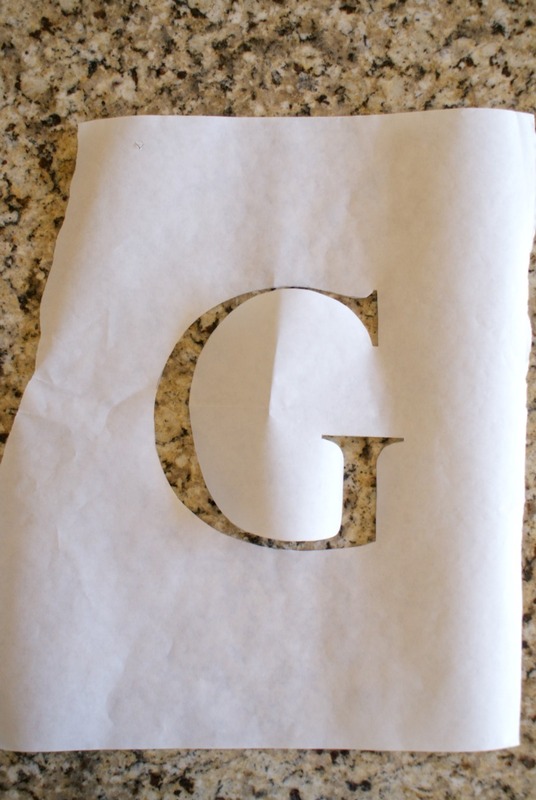 Just like I did for my numbered bar stools, I printed the letter I wanted to use off of the computer, and then traced it onto the flat (not shiny) side of the freezer paper. After cutting out the middle with an x-acto knife, my stencil was ready to go! 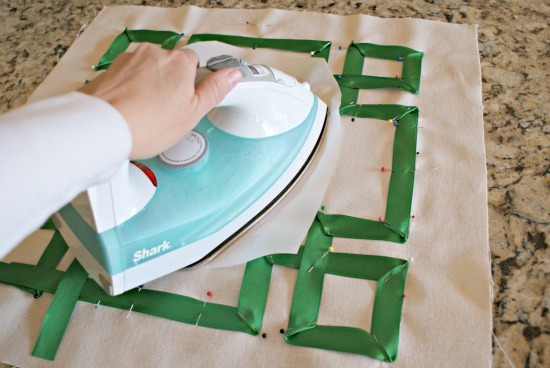 The beauty of using freezer paper is that you use your hot, dry iron to fuse it temporarily to fabric, so the edges are nice and sealed. Then, I used acrylic paint and a foam brush and dabbed the paint on. 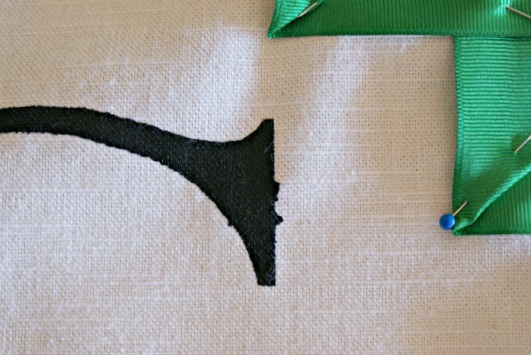 Make sure you have some paper under your fabric, as the paint will most likely bleed through. One coat probably would have been enough, but I went over it again after a few minutes to make sure everything was covered. The moment of truth...most of the letter looked great, but there were a few places where I must not have pressed the edges good enough because it bled through a little bit. It was easy enough to fix with a tiny paintbrush. The best part is, this project cost me about $2! I already had the paint, freezer paper, and the fabric was left over from the bookshelf skirts in the office, so all I bought was the ribbon. However, what it lacked in front-end cost I made up with time spent on it. I can't wait to show you my new favorite little corner where this pillow landed. In the next few days I hope to start changing out from winter accessories to spring, and the pillows are the first piece to that puzzle. It's already starting to feel like spring! How about you? What item would you buy a ton of if you found an amazing deal? Have you decorated for spring yet? Do you use feather inserts? 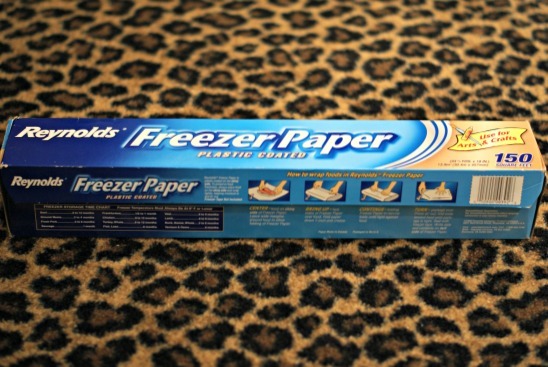 Have you used freezer paper for a craft project before? Tell me. I want to know. I love the mix of fabrics you have going. You are so creative and it all comes together beautifully. OMG Jennifer I LOVE them all!! 1) The chair does read neutral in the photos. (2) The geometric ribbon on the pillow is fab. (3) I paid a decorator to come to my house, very well respected lady in Atlanta whose projects always look like they jumped right out of Southern Living, & she told me that if you use a print fabric, you should use it several different places spread out in the space to provide continuity. She was big on mixing fabrics and hated matchey-matchey, but she did say to use the same print several times to tie together large spaces with an open-concept floor plan. (4) You will never, never, never, never be kicked off my blog list. Some days I don't have time to read all that I subscribe to, but I always make time for yours! 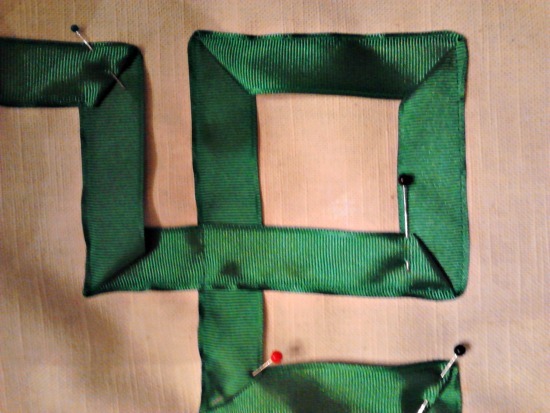 You are inching me towards my scary sewing machine every time you post a project like this. I love the hidden hot pink zipper!!!! That attention to details - so cool. And the green ribbon design came out beautifully!!!! 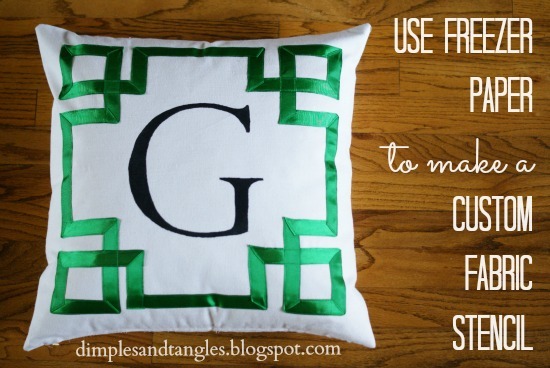 I used a freezer paper stencil to make a monogram on a pillow last year….I like that technique. Love all the pillows! 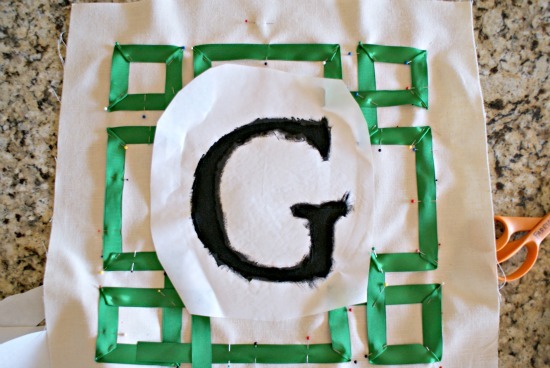 The monogram with the green ribbon is awesome - may have to try something like that myself. I have read the Nester's post on feather pillow inserts, and I agree I like feather pillows much better. Where do you buy your inserts? Nothing, nothing, nothing wrong with more than one animal print ;)! (Especially when it's in smaller touches). Love the happy pops of color. I love how that Greek Key pillow came out! I painted the same pattern on some pillows for my kitchen because I was too intimidated by the ribbon :) I also love the ribbon accent you did on the little pillow with the multicolor fabric (your dining room fabric). Such a pretty little accent! Your pillow turned out fantastic Jennifer, now I want to try and make one as well. I have not had a chance to try freezer paper either. Your cat is too cute, I know the feeling too well. Hope you have a great weekend! Yes I adore you!! Love this!!! Your blog makes me want to actually blog. 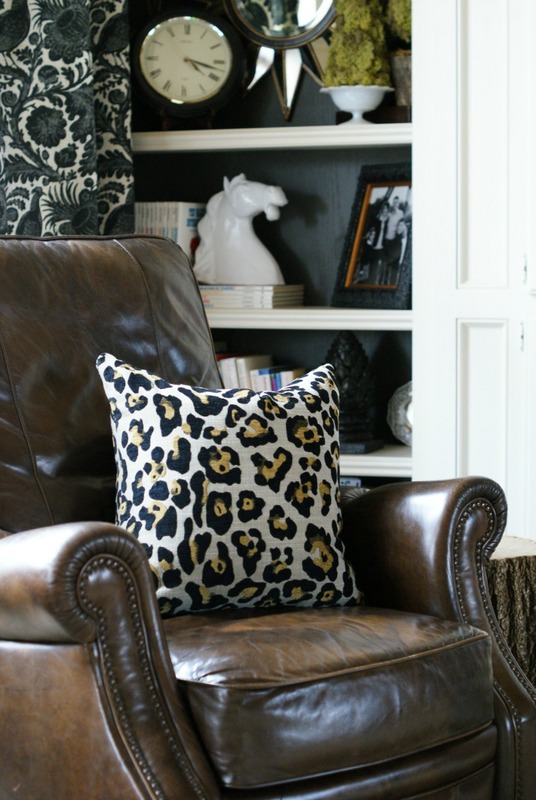 We use so many of the same things I did my daughters room in the link zebra with traditional leopard print. I promise to post As soon as the chandelier is hung! Well, it's my humble opinion that there are no rules in decorating! :) I think it's whatever you like, goes. You are so creative with patterns and colors. 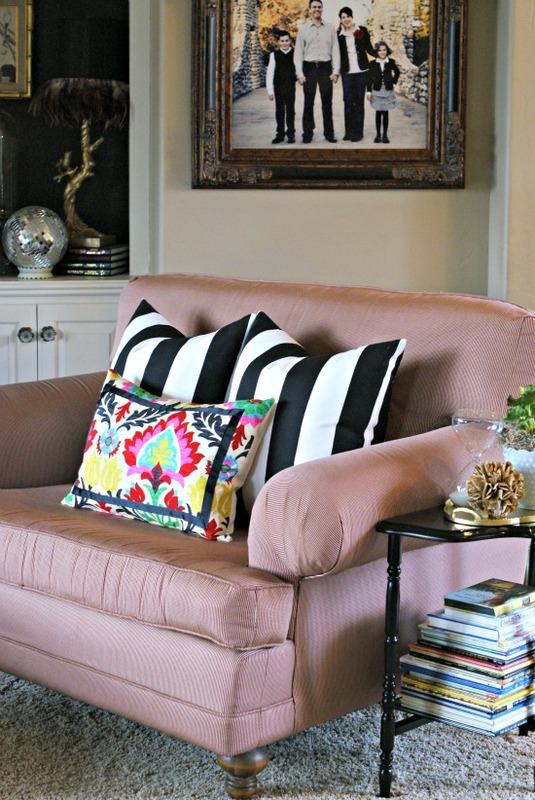 LOVE the pink pillow and the hidden zipper...such a great idea! 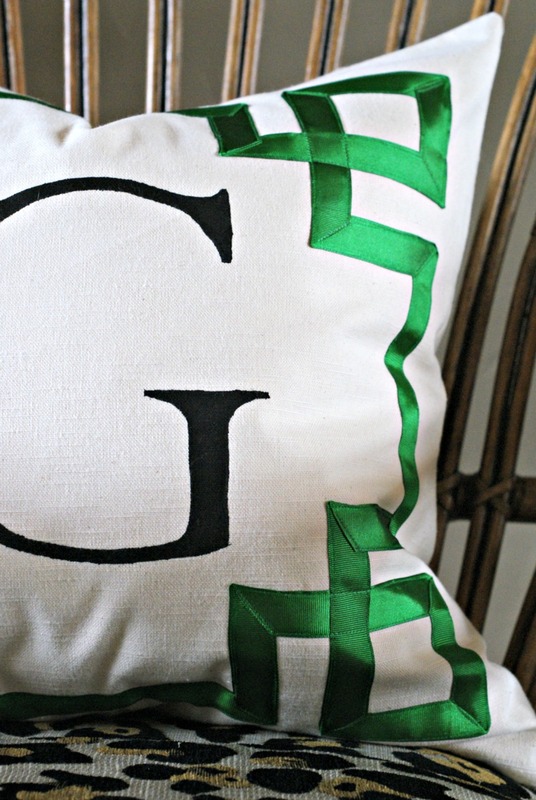 The green ribbon pillow is outstanding! You obviously have a ton of patience. 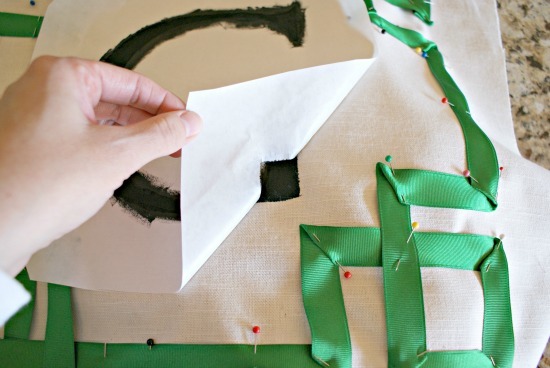 What kind of paint did you use to correct the edges of the initial? Such a wonderful idea to do this! I've never used the freezer paper idea ~ thanks so much for sharing it. Amazingly, last year and so far this year, I'm loving pink! Not the pastel variety, more of the colors you've used. I've never been a pink girl so it's a surprise to me. I'm very ready for spring colors! You are so blessed not to have allergy problems! I am dying with them right now. The wind kicks up and I have horrible problems with my ears and vertigo. I give myself shots twice a week and I'm thinking the meds need adjusting. Anyway, it's a huge waste of time to feel icky. Thanks so much for sharing all your pretties ~ can't wait to see what's next! I have used freezer paper once to make a fun little halloween onesie for my little girl. It is amazing stuff just like you said. I love all your photos! I can tell you're going to be inspiring me!